This was almost a weekend worthy of being buried in the bottom of a pit and being forgotten. There’s just something about trying to find a venue with a supposed entrance on an unlit back road in the middle of the night, or being trapped in a car while trying to find an exit from a mall, or trying to get to the washroom at the back of the busy food court of the aforementioned mall to make you take a pretty jaundiced view of humanity and wonder when the ecological cleansing is going to start. There’s always a light at the end of the tunnel, even when it’s just another oncoming train. 1. We got through it together. In a world where couples fall apart over who puts the toilet seat down (or doesn’t), we managed to get through some pretty stressful crap. 2. Sometimes the simplest sock pattern can make you uncommonly happy. It helps if the yarn is a bit of a surprise as well. Let’s admit it…you can wind and re-wind the ball a dozen times and still not know what it’s going to be like until its actually knit. 3. Babies are the antidote of many of the world’s ills. This is what I’ve taken to calling The Sock of Awesome (aka Awesomesocks). As you can see, I finished sock #1 and have moved on to sock #2. 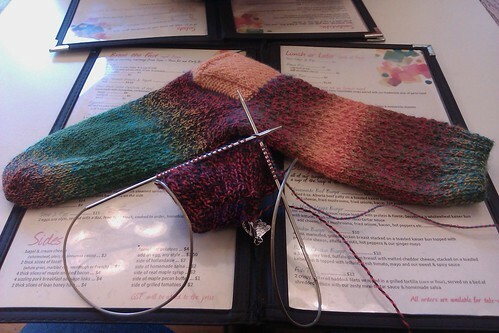 I’m actually a bit farther along than this now; I’m about to turn the heel. Probably with the same orangey Socks that Rock. I just really liked the still-life of sock, sock-in-progress, and menu from Eat!Eat! It’s hard not to love the way these socks are turning out. The pattern is Hermione’s Everyday Sock by Erica Lueder, and the texture somehow suits the marled fabric that comes from the Crazy Zauberball yarn (colourway: frische Fische). It’s enough to make me want to squee. I wish I had a picture of the aforementioned baby. Eventually I will snag a couple of the pictures off of the Husbeast’s cell phone. We are, once again, made honourary Auntie and Uncle to a darling little munchkin. This time it’s a little girl by the name of Sarah Jane who was so headstrong that she wanted to come into the world a little early. After spending a week in the Natal ICU, she’s home and seems to be doing well. Her Mum and Dad invited us over on Saturday and let us get to know her. She’s absolutely adorable, and I was so happy to see her before she starts the inevitable huge growth spurt that will have her fitting into the sweaters I knit for her.